Along Gulou Street in Linfen, North China's Shanxi Province, are buildings that look like imperial palaces, the faces of Angry Birds, libraries, quadrangle dwellings and an ancient pagoda. Tourists may find their jaw drop when they take a closer look at these buildings, as their real usage is as public toilets. Su Qingping, former director of Linfen housing and urban-rural development bureau, is viewed as Linfen's "chief designer" of these toilets. He has spent the past 10 years promoting "reform of public toilets," creating a model city for China's toilet revolution, which has also become a source of cultural confidence for local residents. Su determined in 2008 that everything should make way for the construction of public toilets and came up with the idea of "using public toilets to revitalize urban civilization." 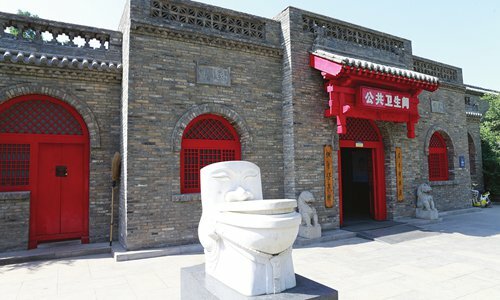 After a decade of development, there are now 88 public toilets in the city center, with a daily reception capacity of each toilet at 2,500 people, according to Hou Yingyan, a guide at Public Toilet School, China's first public toilet-themed museum located in Linfen's development zone. As the country's public toilets - especially in rural regions - have long been a horrifying sight to behold, China launched a nationwide "toilet revolution"campaign in 2015 to make such facilities cleaner and more regulated. Chinese President Xi Jinping said in an instruction on the achievements of the toilet revolution carried out in the tourism sector in 2017 that the construction of clean toilets is an important part of pushing urban and rural civilization, and more efforts should be made in both cities and rural areas to upgrade toilets, the Xinhua News Agency reported. Li Shihong, vice chairman of the National Tourism Administration, told media that the toilet revolution has become a window to show China's image and tell its story. He praised Linfen for providing the world, especially developing countries, with a Chinese solution to their own toilet headaches. 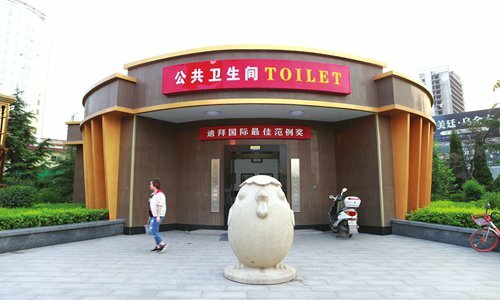 Linfen, a historical coal-mining hub, invested more than 50 million yuan ($7.8 million) over the past three years to develop the city into a potty pioneer, with 40 five-star public toilets, 12 four-star and 60 standard restrooms (the stars were assigned by China National Tourism Administration). The criteria include the design and construction of toilets, accessibility for the disabled, squat-sit ratio, cleanliness and the management system. Outside of each public toilet, a distinctive landscape sculpture, designed for different themes, echoes the exterior modeling of each toilet. Poetic couplets are hung on the doors explaining the cultural connotation with human excrement. These five- to seven-word couplets often attract people to stop and capture this creativity with their mobile phones. "This is indeed our local business card that attracts many like you to come for a visit," a taxi driver told the Global Times in apparent pride. He expects local toilet culture will benefit their growing tourism industry. A map of the toilets around the city center is at his fingertips. The map is also prominently displayed in detail at each bus stop in the city center, giving a clear induction and repeatedly highlighting the density and penetration of the public toilet label into this city. These unique and fashionable public toilets were awarded the Dubai International Award for Best Practices to Improve the Living Environment (DIABP) by the United Nations back in 2012, the highest international honor in the field of urban public toilets. The winning photos hang on the walls of every public toilet, polished carefully by caretakers. "Ten years ago, the sanitary conditions of the toilets in Linfen were pretty poor. Typical ones were thatched spaces full of flies and maggots, with outdoor defecation frequently seen around the corner. Now, you can find a star-class public toilet every few hundred meters on the street," said the taxi driver. Linfen's public toilets are composed of four parts: men's toilets, women's toilets, a unisex toilet and a management room equipped with a bed for the night caretaker. Each toilet is equipped with high-end facilities such as marble walls, wood paneling, matte-tiled floors, glass doors, automatic flush and automatic faucet, all surrounded by a golden border. They are carefully cleaned and maintained around the clock by uniformed staff. Central air conditioning and a sound system playing classical music in the background help users relax and play their gadgets while conducting their private business as a fragrant perfume is automatically dispensed every few minutes. A weighing scale and full-body mirror are also allotted to every public toilet. Locals joked that the scale was for health nuts to weigh their feces. 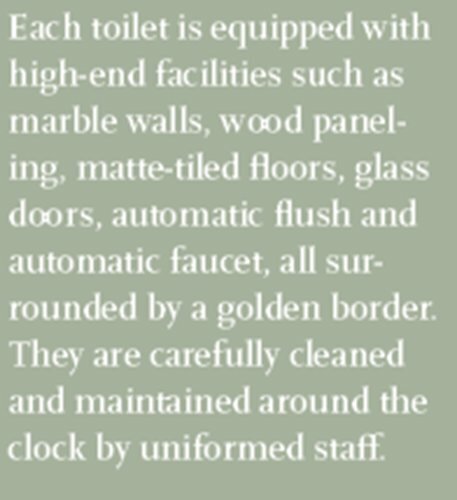 Each toilet has a detailed management file that specifies the cleaning process, periodical assessment criteria and even rules of polite language for staff. Liu Yunhua, 56, took three weeks of training to become the caretaker of #58 public toilet in Linfen. Before her new career, this mother of three was a stay-at-home housewife. Now, Liu earns about 2,000 yuan a month with insurance guaranteed. She takes one day off every two days and sleeps in the caretaker's room during the night shift. When she is off work, rather than rushing home she reviews what people from all over the country have written down in a message book in order to use their suggestions and comments to provide better service. "My colleagues joke that I love the toilet even more than my own home, but I am truly grateful for the opportunity to chat with people from around country," she smiled shyly. Liu told the Global Times that the caretakers conduct a major scrubbing of each toilet around 11pm every night. "You need to be able to see clearly in the mirror whether the ground has water stains," she said, exemplifying the delicacy of her work. "The management department conducts spot checks of each toilet periodically, which does not allow us to lie down on the job," told Liu. While China's nationwide toilet campaign has won praise from the Chinese public, some found that many of these luxury public bathrooms were more like an "urban vanity project." In many regions, it has been reported that local governments continue to spend vast sums of money for the toilet revolution. Some officials and experts are concerned it has grown out of control. 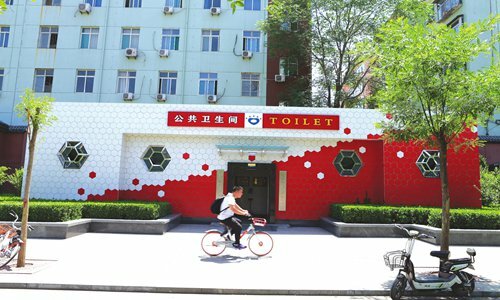 In Linfen, spending on public toilets has soared in recent years, from 500,000 yuan per toilet in 2008 to 800,000 yuan in 2018. Some applaud this investment while others denounce it as extravagant. In many other places, microwaves and comfortable sofas have been spotted in higher-end public toilets; flat-screen televisions and facial-recognition paper dispensers are also trending in big cities, including Beijing. "Luxury toilets, essentially 'toilet shows,' cater to the preferences of some local policymakers in order to appease their vanity behind these 'urban face projects,'" a netizen wrote in online forum Baidu Tieba. 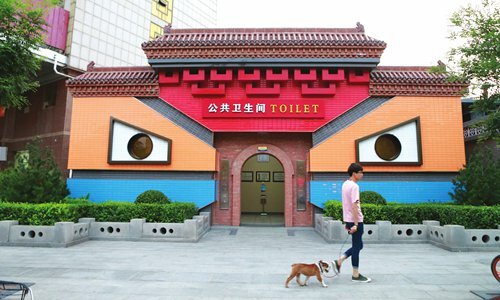 "The criterion for evaluating public toilets should not be its cost or degree of luxury, but whether it is user-friendly and under good management," Wu Zhou, the director of the Collaborative Innovation Center of Eco Design at Academy of Arts and Design, Tsinghua University, told the People's Daily. "Simply making it look luxurious actually deviates from the original intention of the toilet campaign," he added. 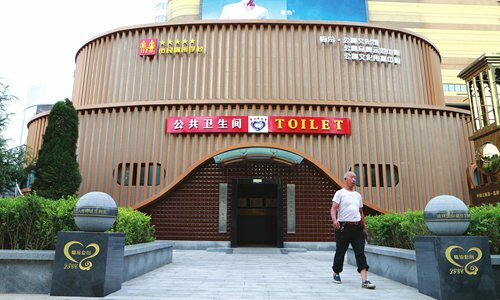 Justifying his rationale for remodeling city toilets, Su Qingping even wrote a book named The Great Nation's Toilet Dream, defending his determination by emphasizing the importance of constructing decent public toilets. "I pretended to be calm in front of everyone, but I was honestly filled with a lot depression and grievance," Su wrote in his book, describing his feelings when hearing dissenting voices during his journey to Dubai to collect his prize. At the end of the book, Su wrote an open letter to all city mayors across China, calling for their attention to local toilet problems. He invited them to visit Linfen's public toilets in order to learn from his successful model. In the meantime, Linfen will build another 100 standardized public toilets and step up their tech intelligence, planning to equip public toilets with Wi-Fi, ATM and even electric-vehicle charging stations.